Talent retention can be the make-or-break factor in an acquisition. 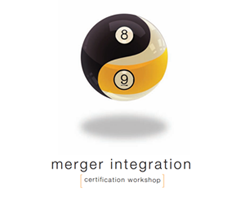 The Merger Integration Certification Workshop teaches acquirers how to identify and retain key players without over-paying or over-promising. Company A merges with Company B. Part of the logic driving the deal is that, in combining the two firms, headcount can be reduced. Accounting runs the numbers and promises annual payroll savings of, let’s say, $20 million. But, of course, you can’t afford to let all those people go immediately. Some of them will be needed to help do the heavy lifting during the integration process. A few of the folks have critical skills…or they possess key information that has to be transferred to other employees who’ll remain. So, in order to keep the integration from going off the rails, you offer a big chunk of money to select people, the bonus to be paid only if they help out for a specified period of time.